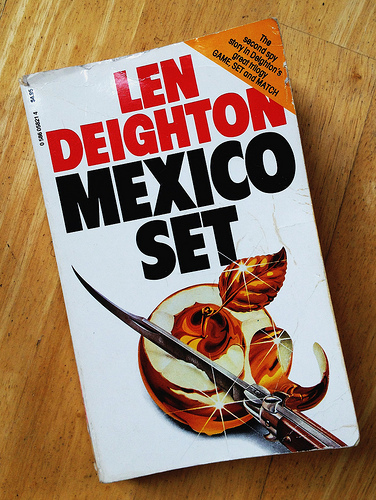 This is the second book in the game, set, and match trilogy by Len Deighton, which is the first trilogy of the nine-volume Bernard Samson series. It’s classic, Cold War, British spy stuff. It’s a big undertaking and it’s going to take me a while to get through this, but I’m savoring it. This book picks right up at the end of Berlin Game. Samson is dealing with the aftermath of his wife’s defection to Moscow, juggling job stress and family stress. His work task: get a high ranking KGB man to defect right out from under his wife’s nose. His personal task: find a way to take care of his two kids and protect them from his wife while warding off advances from two beautiful women. It’s a great mix of spy craft and drama. So far it feels a little simpler and lighter than Le Carre’s Smiley series, but has comparable character development. There’s a lot of detail on Samson and I think he’s a little more approachable than Smiley. I’ll be able to talk more about this after reading Tinker, Tailor, Soldier, Spy (targeting late June). Samson proved highly fallible in this book, almost ruining certain scenes. Twice he was duped by an attractive woman; in both cases I knew as soon as the women entered the scene. I felt kind of let down by the ease with which he was taken in. It’s a theme though that runs through Samson’s character, he is constantly confronted with women he can’t read correctly. It adds an interesting dimension to Samson and makes the books a lot of fun. Deighton couldn’t pull it off though if he didn’t build some solid intrigue, which he does very well. The tension around who’s on who’s side in this game of spies doesn’t take a back seat to anything, all of the other fun stuff is just icing on the cake. The ending is packed with double crosses and epic spy stuff, truly unique batch of trickery played by all sides of the game. Awesome. I have London Match queued up, which I purchased via Abe Books (like this one). I don’t think I’ll be able to hold off much past the end of summer. By the way, Abe Books is awesome for old books – cheap and reliable. Posted in books, tagged pop-fiction, spy on 2012/05/21 by John.